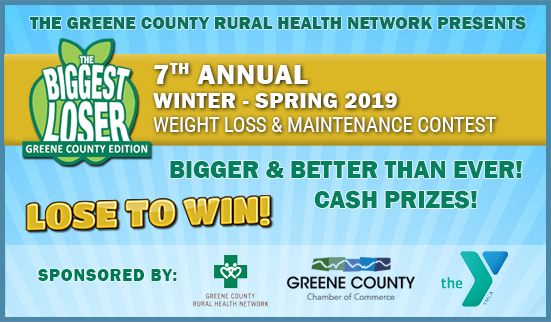 The Greene County Rural Health Network is pleased to announce that our 7th annual Biggest Loser contest will begin on February 4, 2019. The 16-week weight loss contest will end on May 24, 2019. Those who lose at least 5% of their starting weight will be eligible to continue on in the weight maintenance portion of the contest, which will go until August 30th. This is a free contest that is open to anyone who lives in Greene County. All participants must have a coordinator to conduct the weigh-ins. Community coordinators will be available to conduct weigh-ins for those who are not joining with others at work or another group. Click here for the contest rules. Participants who lose at least 5% of their starting weight are eligible to participate. Winners will be drawn at random from those who maintain their weight loss. Mid-Contest Weigh-Ins are optional but anyone who weighs in will be entered into a raffle for 20, $25 gift cards. The kick-off event will be at the Greene County YMCA on Monday, February 11 2019 at 6:30pm. Please contact tonicarrollGHN@gmail.com, if you have any questions. Registration for the 2019 Biggest Loser Contest is now closed. Join us in 2020! Please note that there are more than 15 gift card winners in one category as there was a tie.